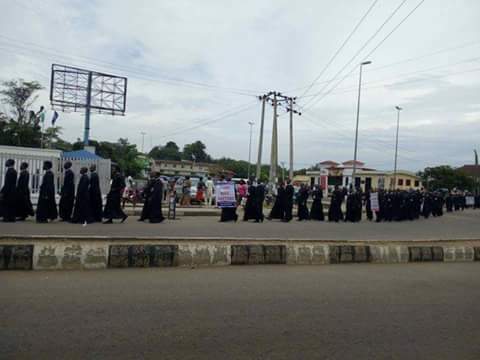 Catholic Priests had a peaceful protest earlier today in Akure, Ondo State against the disheartening killings in the middle East and other parts of Nigeria. 'Every Soul Matters', the priests said. 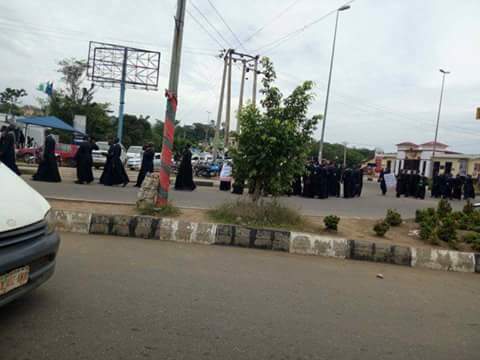 The demonstration is coming days after suspected herdsmen stormed St. Ignatius Catholic Church, Ukpor-Mbalom Parish, Gwer East Local Government Area of Benue State, killing two Catholic priests and 17 parishioners. The deceased were members of the parish who were in the church to attend the 5:30am Mass and burial ceremony. Meanwhile, the Catholic Bishops Conference of Nigeria has called on President Muhammadu Buhari to resign. The CBCN made the call in a communique signed by its President, Most Rev. Augustine Akubeze, and Secretary, Most Rev. Camillus Umoh on Thursday. The bishops, in the communique titled, “When will this barbarism end?” condemned the incessant attacks by the suspected herdsmen, whom they said had turned the country into a massive graveyard. The communique read “That our two priests, Fr. Joseph Gor and Fr. Felix Tyolaha, along with their parishioners were waylaid in the course of the celebration of the Holy Mass early in the morning, suggests very clearly that their murder was carefully planned. This wicked act cannot be said to be a revenge attack (as is often claimed). “Their desperate cries for security and help went unheeded by those who should have heard them. They could have fled but, true to their vocation, they remained to continue to serve their God unto death. “We are sad. We are angry. We feel totally exposed and most vulnerable. Faced with these dark clouds of fear and anxiety, our people are daily being told by some to defend themselves. “But defend themselves with what? The Federal Government, whose primary responsibility it is to protect lives, for its part alleges that those who ask the people to defend themselves are inciting them to take the laws into their own hands. But how can the Federal Government stand back while its security agencies deliberately turn a blind eye to the cries and waillings of helpless and harmless citizens who remain sitting ducks in their homes, farms, highway and now, even in sacred places of worship? “In spite of several calls on the President in the last two years to reconfigure his security apparatus and strategy, which the President has deliberately placed in the hands of the adherents of only one religion and the lack of confidence expressed by the CBCN in the security agencies, the bloodletting and destruction of homes and farmlands had increased with intensity and brutality. “We are sad and fear that the clock is ticking. The bomb must be defused quickly before it explodes. “Since the President, who appointed the heads of the nation’s security agencies has refused to caution them even in the face of the chaos and barbarity into which our country has been plunged, we are left with no choice but to conclude that they are acting a script that he approves of. If the President cannot keep our country safe, then he automatically loses the trust of the citizens. “He should no longer continue to preside over the killing fields and mass graveyard that our country has become. Repeated calls from us and many other Nigerians on the President to take very drastic and urgent steps to reverse this ugly tragedy that threatens the foundation of our collective existence and unity as a nation have fallen on deaf ears. “It is clear to the nation that he has failed in his primary duty of protecting the lives of the Nigerian citizens. Whether this failure is due to inability to perform or lack of political will, it is time for him to choose the part of honour and consider stepping aside to save the nation from total collapse. “Government should encourage and empower citizens to secure themselves and their environments. This is not the time to disarm people with legally procured weapons of self defence.